Week seven of training saw my first week breaching thirty miles in one week, with a Long Slow Run that was considerably longer than I had planned. It also saw much too much in the way of recovery runs and “junk miles” and too little threshold training. First run was Tuesday, when I ran some recovery miles after the Alloa Half Marathon. That was a fairly unexciting recovery run round Dalgety Bay, with a short detour off the road and onto the coastal path. That should have been followed up by a threshold session on Thursday, but I realised that I hadn’t brought my towel with me. Running is fine and well, but spending the afternoon in an office without having washed properly is hardly the way to win friends and influence colleagues. So I went out on Friday instead. This was a simple run out to Aberdour and back – no threshold work – but with the wind in my face on the way, the first few miles were hard work. Saturday dawned bright and early, and I went to the Falkirk Parkrun. I had previously said that I was going to avoid Parkrun for the remainder of my training, but it’s very easy to go to and lots of fun. However, the problem was that I said I was going to have a leisurely run… but when there are all those others around it’s hard to stick to a gentle pace. I ended up doing the 5km in 23:56 – a good minute and a quarter slower than last time, but still better than my previous PB. Maybe that counts as gentle. What was nice about that was getting to run in short shorts – it’s lovely when the weather is good enough for that – but the problem was that they keep getting caught between my legs, and I end up having to pull loads of fabric out from between my legs while running. Elegant, it ain’t! Alloa is a town just north of the River Forth, in Central Scotland. It used to house a major Scottish brewery, but that has sadly closed down, to be replaced by a large Asda store. 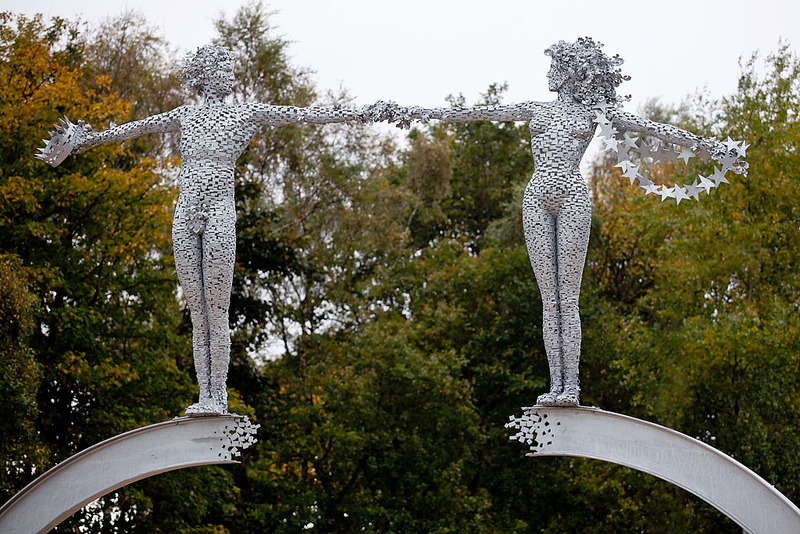 Yet there do seem to be signs of rejuvenation and confidence around the town, perhaps symbolised by the town’s decision to commission a series of wonderful metal plate statues by sculptor Andy Scott. One, called “This Journey’s End”, undoubtedly make a first-class welcome to the town as you approach it from the East. We shall avoid too much discussion of the fact that the organisers had asked people to turn up in fancy dress to celebrate the race’s thirtieth anniversary. We shall not note that in my search to end up with a costume that would not impede my race time, I ended up looking like a cross between Mr Motivator and Borat. And we shall certainly not observe the fact that I was possibly the only runner in the entire damned race in fancy dress! Queueing up for the loo, I noted the Garmin on the wrist of a person beside me. “I’ve got one of those,” I thought. “I wonder where it is…. oh damn!”. I had left the Garmin at home, and while I knew that my phone could faithfully log the route I was going to be left with minimal pace updates through the race, just one every mile. Not much I could do about it now, except curse my mistakes. As the race started, I deliberately moved into the centre of a large group of runners, to avoid being too visible to the “normals” in my fancy dress. I was chatting with one of the other runners when the large crowd started to move forward. Looking over some of the other runners, I could see that the heads of those in front were bobbing up and down, just as if they were running. It seems the race had started (the organisers later apologised that the Public Address system had failed, so the start wasn’t as obvious as it would normally have been). 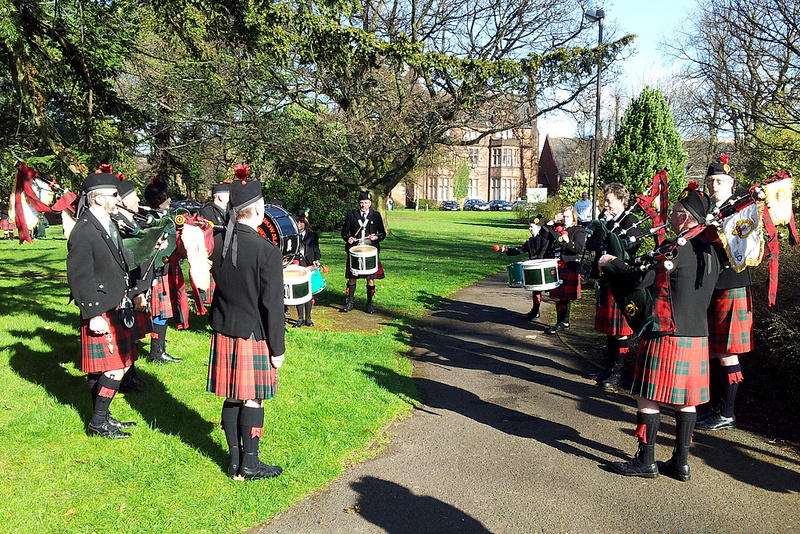 We started off by running around the houses in Alloa. The one-mile mark came up, and my running belt announced to me that the pace was 7:31 minutes per mile. I knew that I had to slow down; I couldn’t last that pace for thirteen miles. But I kept going, anyway. That first mile took us more or less back to where we started, then we lighted off for the hills – climbing from Alloa to Fishcross then down through Benview to Tillicoultry. 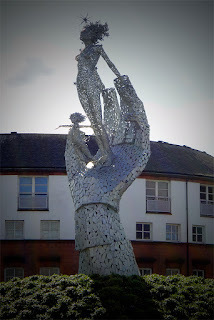 The route from Alloa to Fishcross took us across a roundabout where another Andy Scott sculpture could be seen – a giant hand that represented the support that the emergency serices provide. By the time we reached Tillicoultry, we were five miles into the race, I only had had one mile over 8min/mile pace and I was feeling good. But now we would turn left to go through the Hillfoots, and we would know whether the wind would be a killer. Perhaps I should explain. 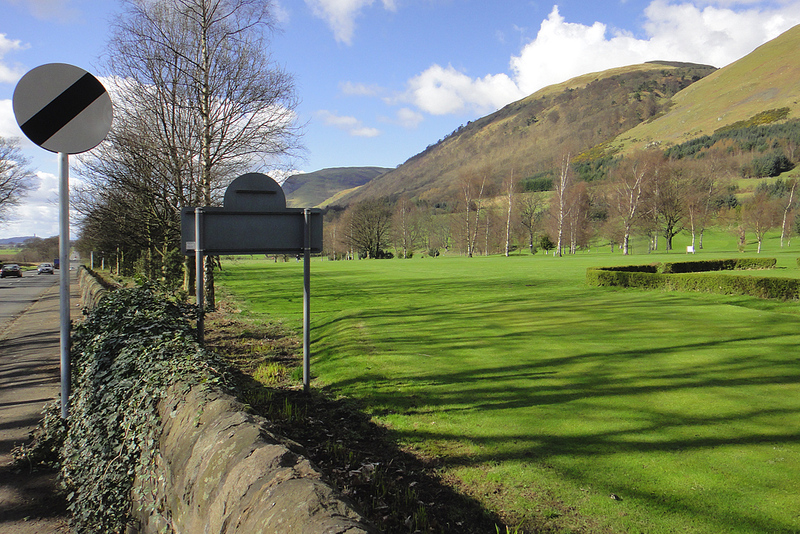 There is a collection of villages at the bottom of the Ochill Hills, that were formed as mill towns. The run-off from the hills was enough to power the mills, and the area became wealthy making fabrics. That particular source of income is no more, and now the area is a haven for day trippers – walkers, cyclists, motor cyclists and so on. To the south, the land is remarkably flat. To the north, the Ochills rise sharply and with no warning, climbing to over 2,000 feet. The weather today was simply gorgeous – cool enough, barely any wind and beautifully sunny. The hills looked wonderful as we ran through Tillicoultry, Alva and then Menstrie. 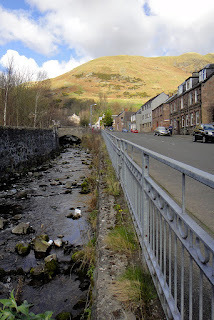 When we got to Menstrie, we were at ten miles – we turned left and headed up the dreaded Menstrie Brae. I’m sorry to say this again. The very last thing I want to sound is arrogant, but seriously, you must put hills into your training. 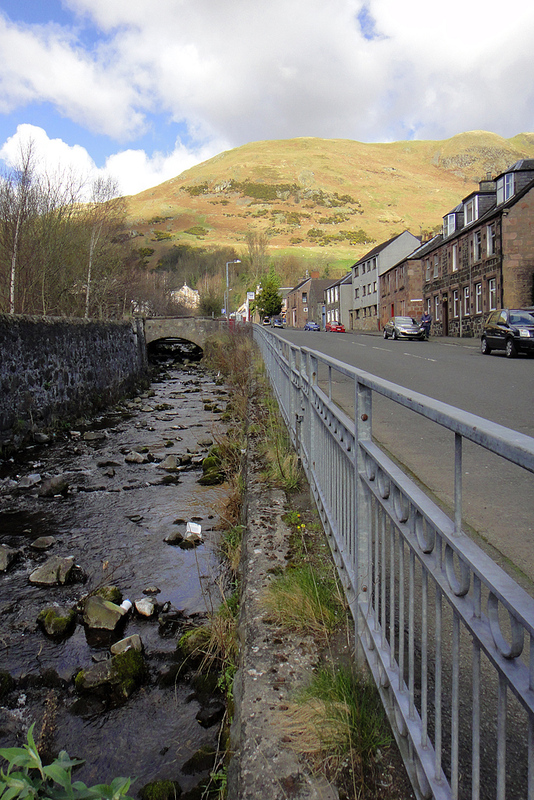 Menstrie Brae is spoken of in tones of fear and reverence, but it is not a big hill. It’s a fairly gentle incline, and while it’s true it goes on for around a mile it is barely fifty metres from bottom to top. To listen to the folk-lore, you could be running up Ben Nevis! We reached the top of the hill around mile twelve, and I knew it was downhill or flat from here on. I also heard my belt announcing the time, and I realised that I could just – possibly – have a chance of making 1:45. Given that my target was “something under two hours” I was delighted, and started running considerably harder than I had been doing. Near the finish, I saw one chap lying on the pavement, being attended to by medical staff… hope he was all right. As we ran through Alloa to get back to the starting point I wondered whether the road would ever end. A turn to the left, and there was the finish line. I ran even harder, determined to have my moment of glory… and then I was through, and the RAF cadets were very kindly offering to cut my shoes off… I mean, cut the timing chip off my shoes. 1:44:00 – I felt absolutely wonderful about that! The more so since I don’t actually feel excessively tired or sore! So, thank you very much to the Round Table and all others involved in organising this thoroughly enjoyable half marathon – and well done on a splendid race! 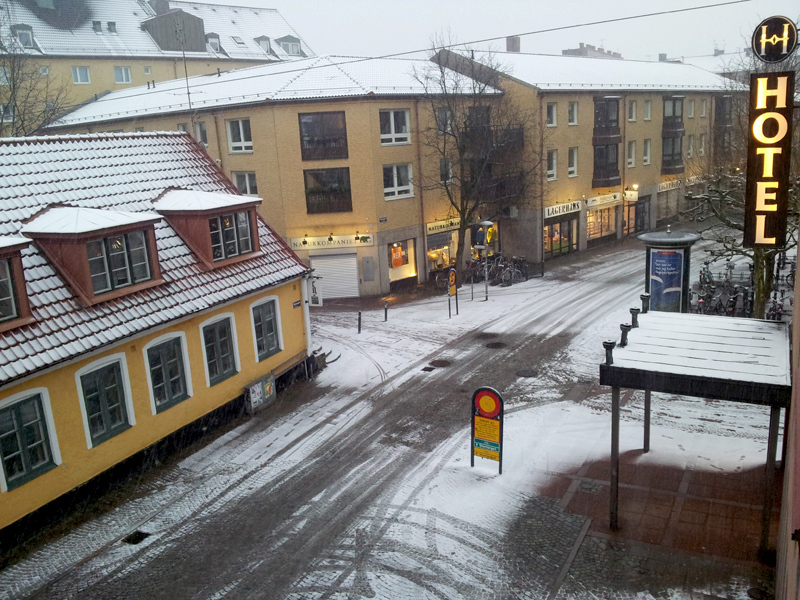 Another week of training disrupted by business travel… this time I spent a couple of days in the beautiful, yet snowy, Swedish city of Lund. This was a lovely opportunity to see somewhere new, but on the other hand it did rather mess up the training schedule. I ran my Tuesday run as normal, but the Thursday run simply didn’t happen. Come Saturday, I decided to do the parkrun – and then the obvious thought was “why not run to the Parkrun?” It’s only three miles to the park, it’s all downhill and would be a great warmup. So, that’s what I did. and it obviously worked – not only did I manage to put in the miles, but I smashed my PB at the Falkirk Parkrun – down from 23:59 to 22:34 – a whopping 85 seconds off my best time! It was today that things went downhill. I realised I was tired when I started my LSR – things just weren’t right. But I ploughed on regardless, and ran along the canal to the Bantaskine tunnel. Then I walked through it, and then ran another couple of hundred yards. So, I added on an extra mile. And now I’m tired. Oh well, nobody to blame but myself. 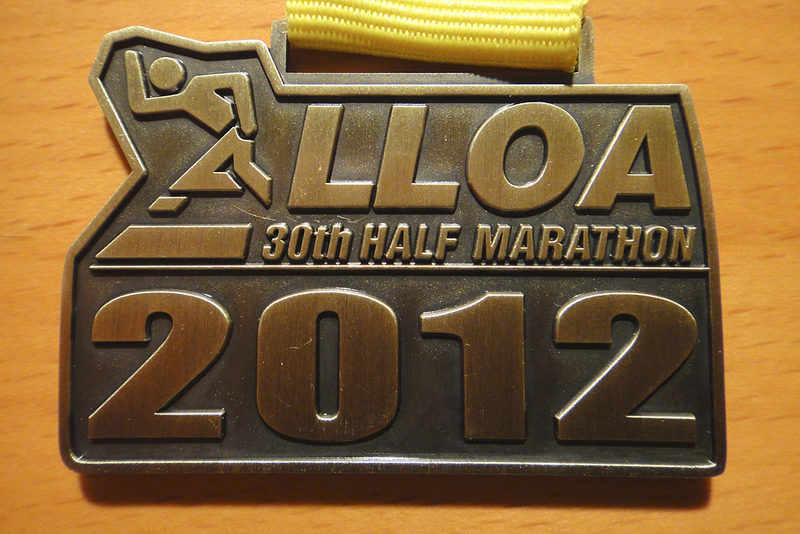 I predict a week with very little running in the lead-up to the Alloa Half Marathon. If for no other reason than I have finished “Faceless Killers” and need a new audiobook! So, that’s four weeks of training complete. One quarter of the way to the marathon. Wow! I have a confession to make – I missed a run this week. Yesterday’s (Saturday’s). I just didn’t feel in the mood for it. The trouble really stemmed from the start of the week. After the Devilla 15km run I was feeling really tired. On Tuesday I ran what was essentially a recovery run, then on Wednesday I travelled to Stevenage. Once there, I slept pretty badly, but decided that after work on the Thursday I would do a threshold run. This, I think, was my mistake. I was rushed, poorly rested and it all just felt wrong. After a long journey home by train on Friday, it is little wonder that I just couldn’t motivate myself to get out on the Saturday. So, I made an excuse that I was resting before the Lasswade 10 mile run. Next week is going to b a bit of a cut-back week, in effort if not in distance. 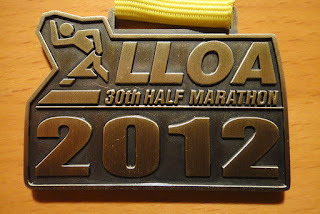 Think of it as a sort of mini-taper before the Alloa Half Marathon, which is two weeks today. Today was the Lasswade 10 mile race, organised by the Lasswade Athletics Club. After my failure to manage my bladder properly at last week’s Devilla Forest 15km race, I was careful to start the day without any coffee. So it was a slightly bleary Ham that drove east to get to the race. The first sign of the level of organisation for the race was that road signs had been erected all the way from the Edinburgh City Bypass to the village of Rosewell – the signs starting a good five miles or more from the village. As I neared the village, I saw a whole row of cars parked at the side of the road. Well, we had been warned that parking in the village was limited, so I dropped the car off at the side of the road with all the others and walk a quarter mile or so to the village. The weather was crisp and quite cold – the nearby Pentland Hills were covered in snow – but at least it was dry and no wind. Registration was quick and easy, and I was especially impressed that I was given a polythene bag with my race number – I could put my stuff in there and would be able to collect it at the end. Soon I returned to the registration area for a quick visit to the gents, then I walked to the start line. I took off the last of my outer layers and put them in my bag, and left it with all the others at the start line. Seeing a portaloo there, I decided that I would make one final visit. There was a bit of a queue, however, and I was just finishing my abolutions (inside the portaloo) when the starter’s gun went off! The race had started, but as I dashed out I realised that I was in fact just able to join the group around two thirds of the way down the pack – probably exactly where I would have aimed to be! There was a moment of confusion as my Garmin took a few seconds longer than I would have chosen to get a GPS lock, but within ten seconds or so it had picked up the satellites, I had managed to start the timer and the race was on! As can be seen from the GPS plot, the route starts with a gentle uphill stretch for a little over a mile almost a mile of glorious downhill. But any road runner knows that when you go downhill, then come to a river flowing through a valley, there is a reckoning to come! That reckoning was in the shape of a 16% hill we had to climb! To be fair, the 16% part didn’t last for too long, and once again I was grateful that I live in a hilly area – it was on the hills that I was able to overtake people. On the flat I reckon that I was overtaken much more than I overtook – the hills were the opposite. With minor moments of respite, the uphill continued from 2.25 miles through to about 6.3 miles. And yet what goes up will eventually come down! Won’t it? I had been hoping for 1:20 for this run, but by the water station at six miles I realised that this just wasn’t going to happen. 1:25 was still (for me) a pretty fair time, and so I set that as my new goal. But as the downhill miles continued, I started wondering. Could I possibly catch up? For the final two miles of the race, I ran as hard as I ever have in my life. Yes, they were substantially downhill, but even so I don’t think that I’ve ever run two miles at 7:30 minutes per mile pace. I was really feeling it as I ran, but since I was overtaking more people than passed me I reckoned I had to be doing something right. Suddenly I came across a wonderful sign saying “400m to go”. The sign was a little earlier than the Garmin had suggested, but was no less welcome for that. Soon, there came a “200m to go” sign – I couldn’t let up the pace now – and I crossed the line in what my Garmin tells me was something around 1:18:29. Allowing for the slight mess-up at the start, I still reckon I should be counting on a time under 1:19 – which delights me! After the race, there was a hugely impressive spread. The good people of the Lasswade Athletics Club and their spouses must have been baking for weeks prior to the race! While there I met someone I had been speaking to at the Marathon Training Event held in Edinburgh a few weeks ago. She is recovering from injury, but still plans to do the Edinburgh Marathon – and in a good time; not just finishing it! I was very impressed by her determination! After the prizegiving I collected my stuff and went home, being caught in a cold and miserable hail shower on the way. Good thing that didn’t fall during the race – it would really have put a downer on the race! So, my thanks and congratulations to the Lasswade Athletics Club for a meticulously well organised race, over varied and very attractive scenery. Definitely a race I would recommend to anybody – well, anybody who’s tough enough for a few hills!